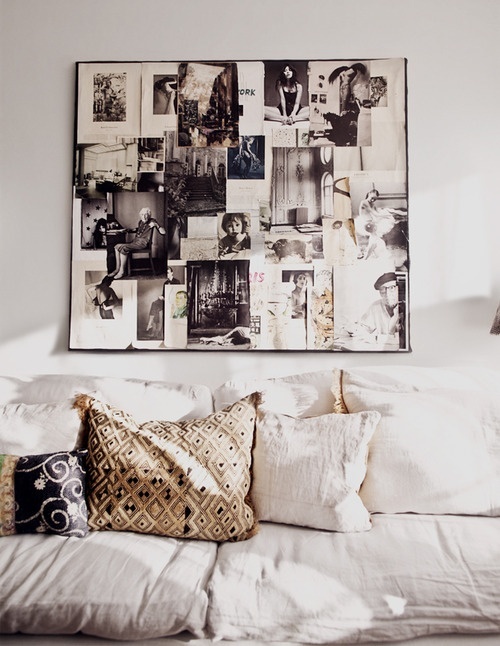 As you know, I love creating moodboards from images I find via my Pinterest boards or around the web, but today I'm going to talk about the real-life kind that you can make for your home. To start with, I've found some great ideas for turning simple photo collages into something fun and unique. 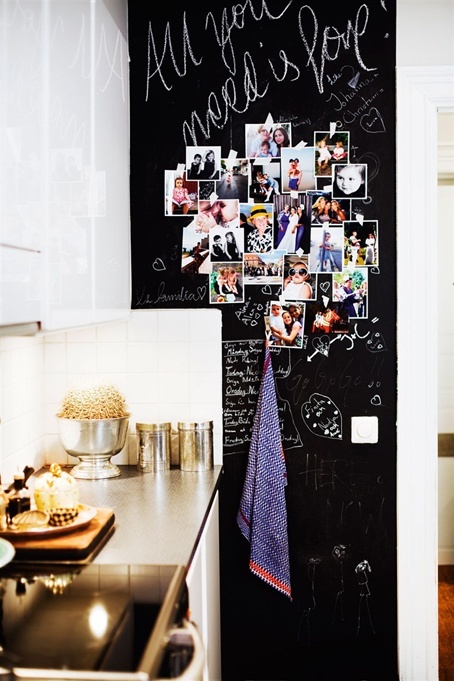 Sticking your favourite photos on to a blackboard wall, like in the kitchen above allows you to personalise the surrounding area with messages, drawings or quotes. In addition to family photos you could stick little keepsakes like treasured invitations, tickets to a memorable show or even your child's artwork. 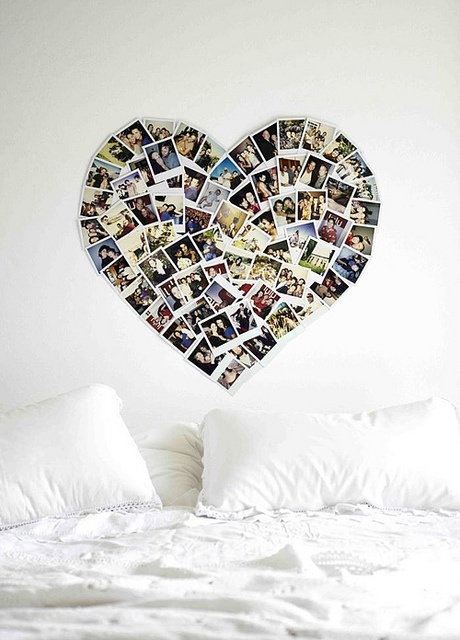 A cute idea for the bedroom or living area, heart shaped collages are very cool, as is the one below which covers the entire length of a bedroom pillar. 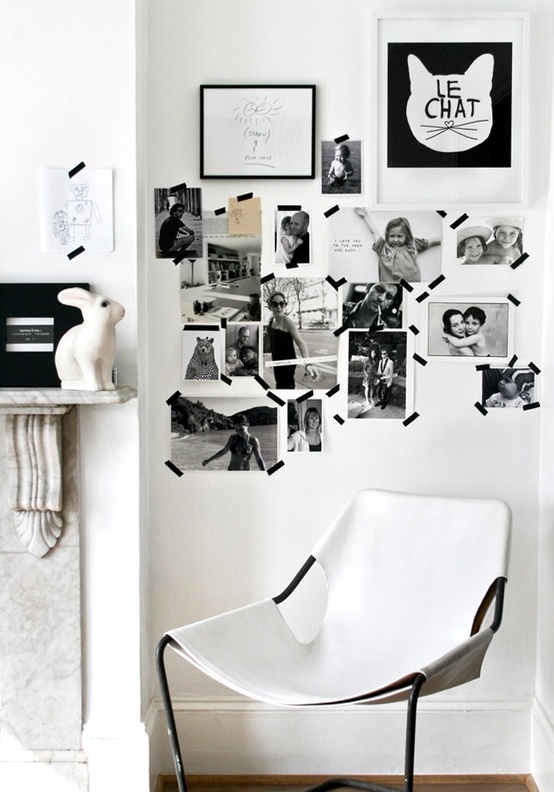 I love how Karine Kong of Bodie and Fou has used black washi tape to stick pictures on to the wall of her London home. 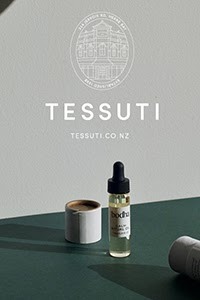 I'm looking forward to displaying a moodboard in the workspace of our new home. 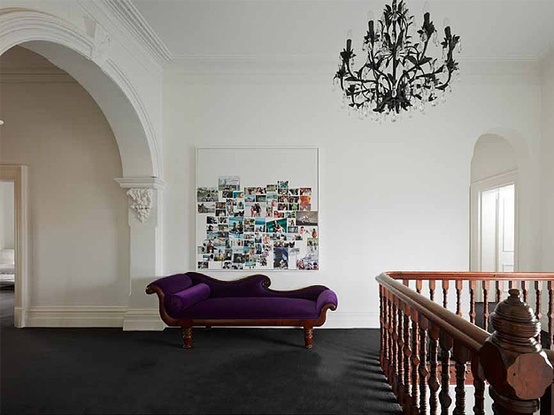 Personal photos, tear slips from favourite magazines and catalogues, postcards or any work-related/personal inspiration can be brought together to create an eye-catching feature. 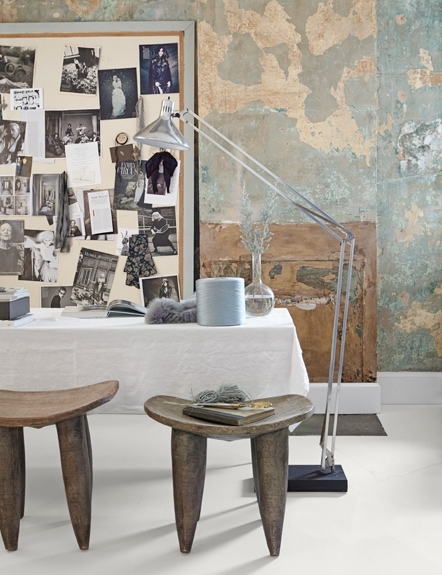 As with my virtual moodboards, I like the idea of sticking to a colour theme. 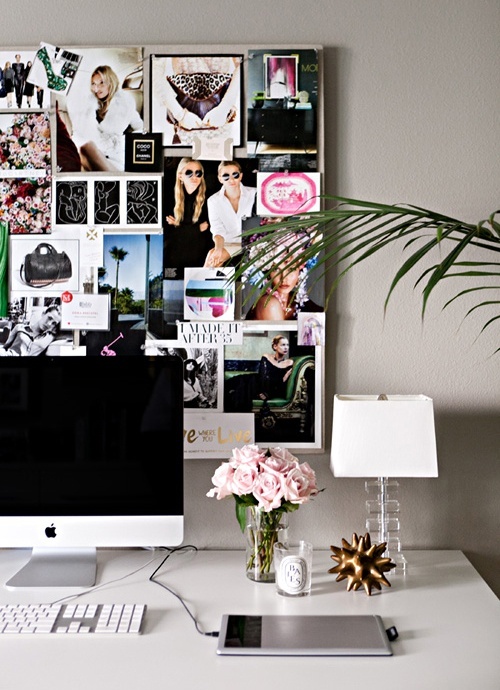 Always a winning combo, the workspaces shown below are gorgeous in black and white with touches of pink. The curator of the one above has gone all out, covering the wall above the desk with a mix of fantastic visual inspiration. 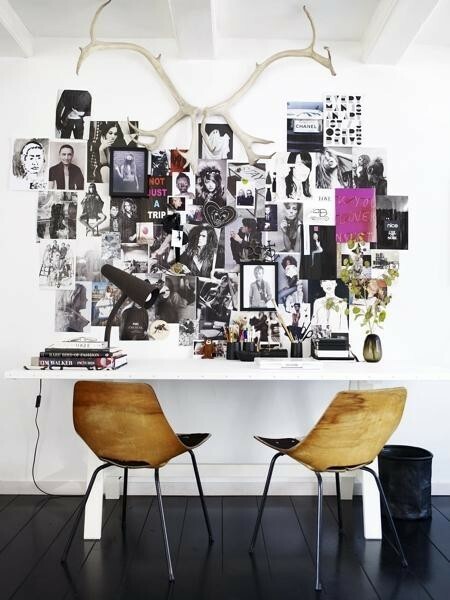 Completing the look, in true Scandi-style, are a pair of fabulous antlers. 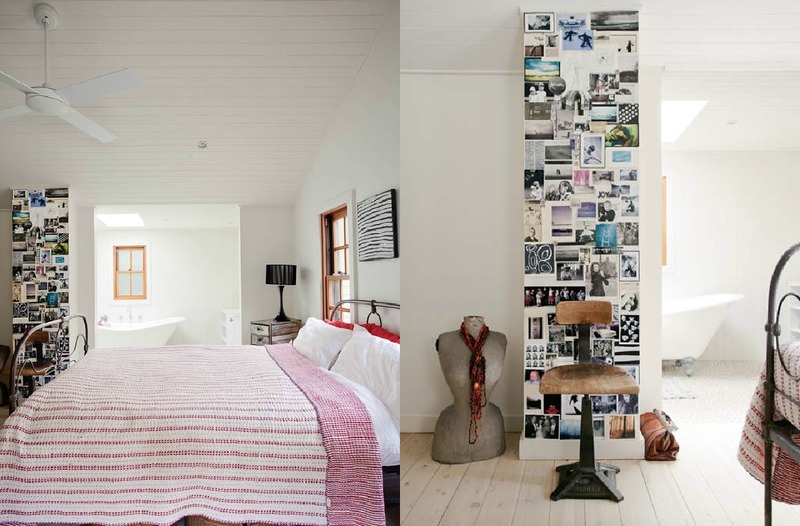 An alternative to sticking images to the wall, you can use a board like in the one above. A store bought memo board, piece of plywood or board covered in fabric would do the trick nicely. Below are some more ideas, including a couple of clever DIY's. This one, thanks to Heidi of the gorgeous Norwegian blog FruFly, is simply a canvas painted with blackboard paint. 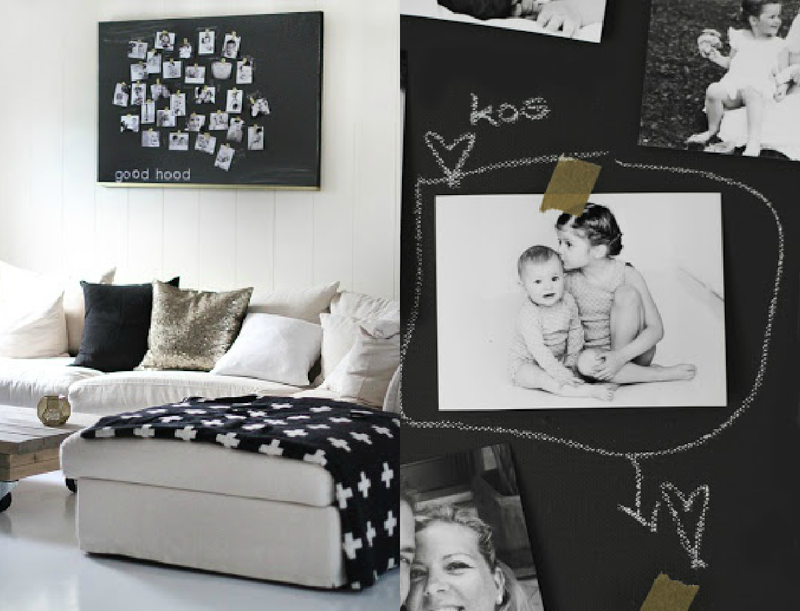 Special photos, together with little notes and doodles make for a very sweet family moodboard! 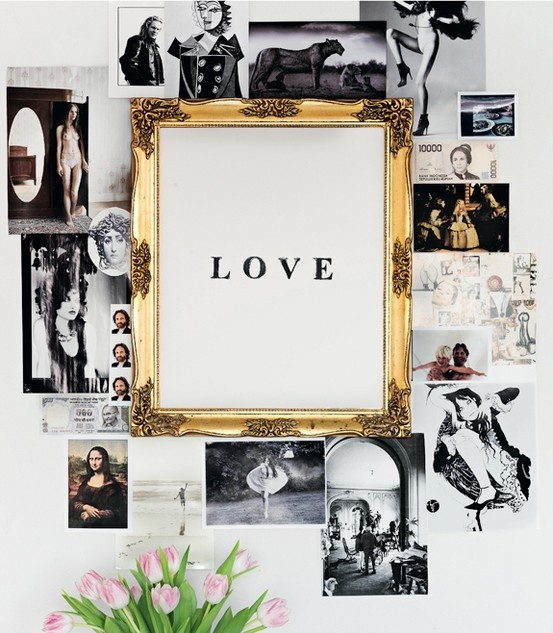 I especially love the gold framed 'love' moodboard and the one above made from a vintage pull-down map. 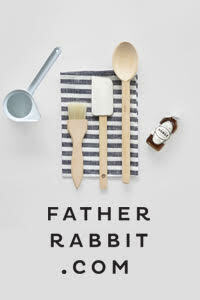 I hope that's given you a nice dose of design inspiration for your Monday! One more thing before I go... you may have noticed that I've installed a 'pin it' button on the blog, which means you can now pin images from my posts to your Pinterest boards with one click! Simply hover over the image until the 'P' appears on the top right-hand corner, click on it and pin! So easy! Oh I love this post so much. It inspires me a loot to add spice to my living space. SO many good ideas to try out! Definitely a good dose of inspiration! 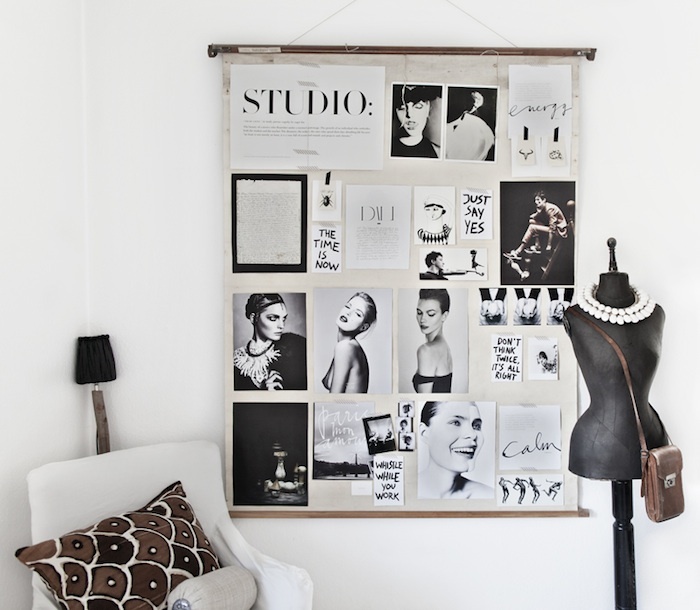 Wonderful stylish ideas to display photos in a tidy, neat way. I don't like to have too many photos frames in one room yet it's a shame to keep photos hidden away. A lovely surprise to find that you are my new follower - thank you. I've spent some time looking at your previous posts and I'm pleased to be following on Bloglovin' and Pinterest - looking forward to more design inspiration! Fabulous interiors how fascinating and such a positively vibrant colour.